Restoring family links | The American Red Cross is working with its global Red Cross partners to reconnect family members separated by the earthquake. To search for missing friends and family, please use the Restoring Family Links page. 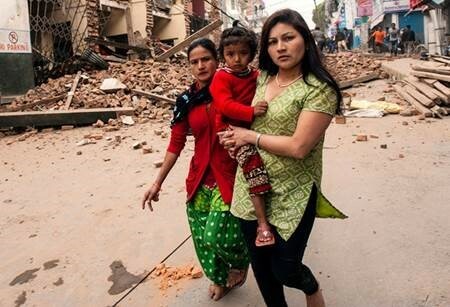 The 7.8 magnitude earthquake struck Nepal on Saturday at midday. The epicenter is located 48 miles northwest of the capital, Kathmandu, with over 6 million people living within 60 miles of the epicenter. 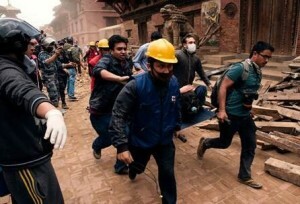 Initial reports indicate the earthquake resulted in more than 3,300 deaths and injured at least 6,800 people. The earthquake also affected surrounding countries, resulting in deaths and damages in parts of Bangladesh, China and India. The death toll continues to climb as more information becomes available. 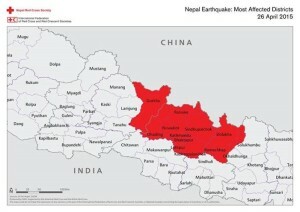 The earthquake affected an estimated 8 million people in 39 of Nepal’s 75 districts, including Nepal’s two largest cities – greater Kathmandu and Pokhara. Immediate needs include food, water, shelter and medication. The United Nations reports that more than 1.4 million people are in need of food assistance. More than 20 aftershocks — ranging between magnitudes 4.5 and 6.7 — followed the initial earthquake. Mountainous terrain in the northern part of Nepal is vulnerable to landslides and avalanches; reports indicate that earthquake shaking has led to avalanches in the Himalayas. The earthquake damaged buildings and infrastructure and disrupted mobile telephone communications in some areas, particularly in and around the capital city. Responders report that hospitals are operating, but that additional support is needed. Assessments are ongoing and the full extent of the damage is not yet known. The government of Nepal declared a state of emergency in earthquake-affected areas and requested international assistance. Government-identified priority needs include search-and-rescue capacity, medical assistance, rubble-removal equipment, and logistical support. The Red Cross invites you to help the victims of countless crises around the world each year by making a financial gift to American Red Cross International Services, which will provide immediate relief and long-term support through supplies, technical assistance and other support to those in need.